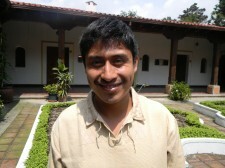 Adolfo Eduardo Có Coy was 25 years-old when he was selected as a GOJoven Fellow. This indigenous youth leader who is fluent K’iché, Poqomchi and Spanish. He is the president of Equilibrium, an autonomous youth group that focuses on gender equity, human rights and agricultural issues. He has coordinated a wide range of projects, including an organic composting with the Community Development Advisory Board (COCODE) and maternal mortality prevention. His goal is to create job opportunities for youth in businesses like the small construction company he owns and to do effective outreach in SRH to communities that have little access to such information so that they can make informed decisions about their lives.